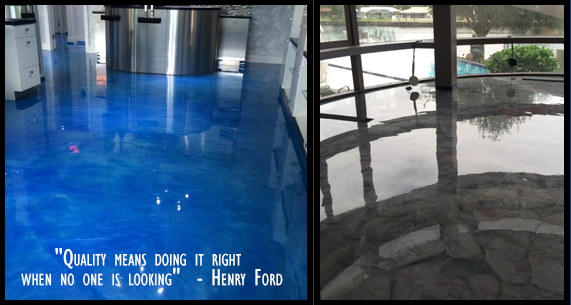 NSI Epoxy can transform an ordinary, cracked, pitted, stained floor into a showroom. Samples of different floor types, concrete crack fillings and colors are brought before we begin. Our process starts with the examination of what we are coating. Your residential, commercial, or industrial project will never look the same. In order to remove pre-existing dirt, oil, and grease on the surface of your floor, we use a diamond-grinding technique for concrete grinding to ensure proper adhesion and a quality finish. We continue cleaning by vacuuming the concrete and blowing out all dust and debris before patching cracks with 100% solid epoxy for the concrete sealing. Contact us to provide square footage and floor details for a quick estimate on our full-service epoxy floor coating services. Your epoxy floor coating needs are served with NSI Epoxy of Waterford, Michigan. You receive a detailed assessment of what to expect before we send a crew out.